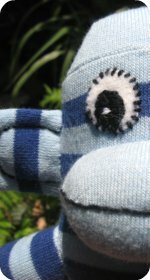 How to make a cute (or in my case, strange looking) sock elephant toy, with free, easy to follow pattern and instructions. Cut 3-1/2 inches off rib of sock. Starting 3 inches from heel, sew 1/8 inch seam each side of center line and across end of ribbing. Cut sock between seams and about 1-1/2 inches farther to make opening for stuffing. Turn right side out. 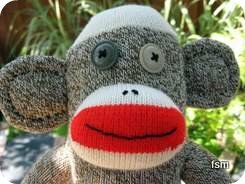 To shape head, stuff foot of sock nice and plump and tie off loosely at neck with ribbon. Insert 1-1/2 inch circles of cardboard in feet and stuff. Finish stuffing, sew legs and slit in crotch, making one seam on underside of body and the other up towards the tail. Cut second sock as shown, about 5 inches long. Turn inside out, seam along one side and across foot. Insert pieces of cardboard in feet, stuff, and attach near front of body. Cut off complete heel from second sock. Stuff lightly and sew to head. Stitch across center to shape mouth. Open flat strip of sock so that it is about 1 inch at one end and 6 inches at the other. Round the wide end. 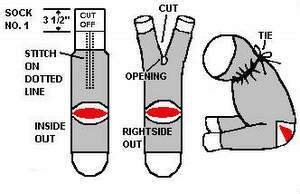 Fold in half lengthwise, inside out, and seam along one edge and around narrow end. Turn right side out and stuff. 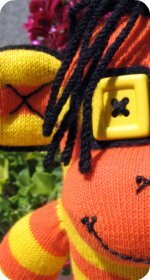 Sew to head just above mouth with seam underneath. To bend and hold trunk in various positions, insert a piece of wire through length of trunk. Insert pipe cleaner tusks. For each ear, cut two pieces in shape of ears. Seam and turn inside out. Sew on level with highest point of trunk. 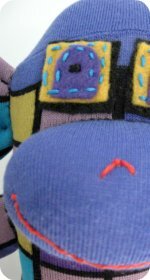 Sew on moving eyes, buttons, felt or embroider with black thread. 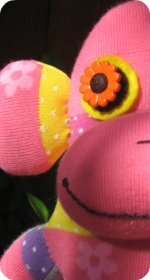 (For very small children embroider eyes). Make small short roll of material and sew in place. Trim is optional. A fringed strip of bright material can be placed over the back or tassels may be sewn on. 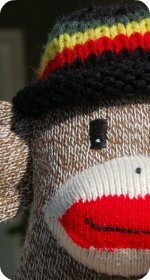 Rickrack, little bells, ribbons or beads naturally give the toy a more festive, circus-like appearance. 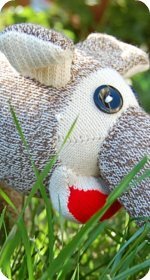 Socks: use Rockford Red Heel Socks to make a traditional looking elephant. Alternatively, you could use some elephant skin socks, that would look really good. 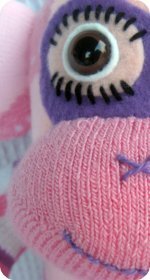 My first attempt at a sock elephant with rather interesting results. I need to make some more to get into the groove of making them and hopefully come up with some better results. 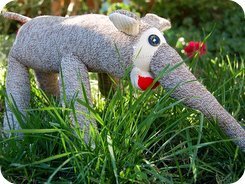 You can vary the elephant pattern to create large or small ears depending on whether you are sewing an African or Indian elephant toy.